Each one of us has a crowd of angelic beings in attendance with us in every moment of our existence. We each have many angels, guides, teachers and ascended masters who work with us throughout our lifetime. Some travel with us always, while others come and go. 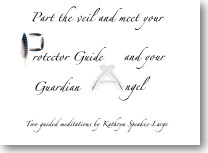 Welcome this opportunity to meet both your Guardian Angel and your Protector Guide. Meet your Protector Guide, a native of the country in which you were born. Meet your Guardian Angel who has been with you throughout this lifetime.